May their souls, and the souls of all the faithful departed, through the mercy of God rest in peace. On September 22, 1217, 800 years ago today, legend has it that seven Dominican friars entered Paris for the first time, together with their brother friars in Bologna, Italy, to begin teaching at the university there. The Dominicans were founded by St. Dominic de Guzman the previous year as a mendicant order (support themselves by begging) who would focus on preaching, teaching, and correcting heresy. The Dominicans have for centuries provided some of the church's most brilliant theologians from St. Thomas Aquinas and St. Catherine of Siena in the middle ages to Yves Congar and Marie-Dominique Chenu at the Second Vatican Council. The Feast of the Exaltation of the Holy Cross seems like a strange concept. Why on earth would something like the Cross be exalted. Would we proclaim the glory of the guillotine or the ecstasy of the electric chair? Of course as Christians we shouldn't be shocked by paradoxes such as the exaltation of a weapon of execution. Our Faith holds to notions such as the Incarnation, which states that Christ is both God and human; the Trinity, which tells us that God is both one substance and three persons; and of course Jesus' teaching which proclaims that the last shall be first just to name a few. Our theology of the Cross is no different. As we prepare to commemorate the 500th anniversary of the beginning of the Protestant Reformation in October, I am reminded of the extensive writing of Martin Luther on this very topic. For Luther all of Christian thought retains this paradoxical structure, and nowhere is it more evident than in his theology of the Cross. Luther uses the phrase fröhliche Wechsel und Streit, the happy and quarrelsome exchange, to describe what's going on with Jesus' crucifixion. For Luther the Cross is not simply a sad event from the life of Christ, it is an exchange, an exchange that is at once glorious and sorrowful. The Cross is about Christ taking on the sin, death, and darkness of humanity and exchanging it for the redemption, life, and glory of God. It is a trade that at once reminds us of the fallen nature of humanity and the infinite mercy of God. Thus the Cross becomes our salvation, a glorious exchange, and something worthy of exaltation. I am not old enough to remember the great anti-Apartheid activist Steve Biko in life. At the time of his death in a Pretorian prison cell I had not yet been born and my memories of Apartheid South Africa are limited to it's death throes in the late 1980s and early 1990s from my safe home thousands of miles away. It seems, as we celebrate today the 40th anniversary of his unjust and violent death at the hands of an inherently racist government, his memory, at least in the United States and much of the western world, has been neglected. In fact, if it weren't for the song Biko written by a personal favorite Peter Gabriel, many of us may have never encountered his legacy at all. So why, on a blog written by a Catholic priest in northeastern PA, would I want to touch on the life and death of a man who lived in a country that is not my own, in an era that is long past, and who didn't appear inherently religious at all? It's simple--Biko's legacy touches on something that is as important today as it was in South Africa in the 1970s--dignity. 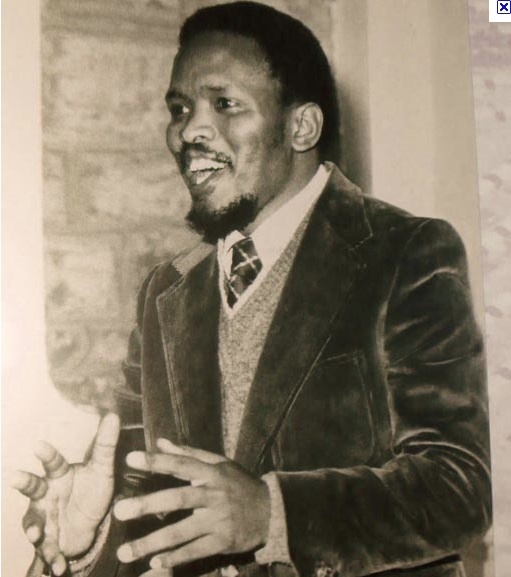 As a teenager Biko was expelled from all government schools for his involvement in the Black Consciousness Movement and eventually found a home at the Catholic St. Francis College in Natal. You can still read some of his commentary on his time there, how he learned of the contradictions between the Gospel and the "Christian" society in which he lived and became better able to realize the true call of Christ to the black community of South Africa. So much of his writing, his speaking, and his impact centers on the idea that what was/is needed above all for the oppressed black majority in his home country was a sense of dignity, of pride in being black, of eliminating the false and dangerous notion that they belonged to an inferior race. The Black Consciousness Movement was about more than reforming political or economic systems, it was about restoring a sense of dignity to the minds of black South Africans, of allowing his brothers and sisters to feel proud about who they are and be willing to fight for a more just society. I do not claim to be an expert on the thought of Steve Biko nor am I qualified to examine or explain his message. I do, however, think it is worthwhile today, 40 years after his death, to take a chance to examine his legacy. A quick Google search today will undoubtedly lead you to no shortage of interpretations. It seems to me, though, that above all he sought to bring dignity back to his black community. It is the dignity of the human person that lies at the heart of all Catholic social teaching, dignity that is God-given and inalienable--a truth Steve Biko knew and was willing to die for. Today, September 5, 2017 is the feast day of St. Teresa of Calcutta and the 20th anniversary of her death. I had the opportunity to offer Mass for her order, the Missionaries of Charity, several times while living in Rome and working with them from time to time as they served the poor and I must say, the stories that you may have heard about their selflessness, dedication, and love for all are not exaggerations. Day begins with Mass at 6 AM and continues, non-stop, from then on. The Missionaries of Charity follow the example of their foundress by dedicating their entire lives to those in most need. It is inspiring (and tiring) to see them in action. Whenever I hear criticism of Mother Teresa following the line of the late Christopher Hitchens it is obvious to me that the individuals leveling the critique have never had the privilege of working with these holy sisters. They are doing work that no one else is willing to do, helping those whom the rest of the world has forgotten. Perhaps the most inspiring thing about their work is that they are not simply concerned with providing material relief for the poor, they provide the spiritual and psychological tools necessary for them to endure suffering. While we can and should try to eliminate poverty and suffering as best we can, we live in a world in which they are often inevitable. In addition to needing food, water, shelter, and medicine, the poor and suffering of the world need faith, hope, and love. The Missionaries of Charity, in addition to helping with material needs, provide the spiritual tools necessary to endure suffering in a difficult world. What a gift, what beautiful work. I'll leave you with the words of Mother Teresa during her visit to the University of Scranton in 1976- "know poor people in your own home and local neighborhood"--let us learn to know and serve the poor in our midst, offering them material relief, skills, and spiritual assistance in faith, hope, and love. There are countless variables and constants within physics, biology, and astronomy that, were they just a hair different, would make life on earth impossible. The laws of gravity, the improbable development of DNA, and the Earth's distance from the Sun, among other things, seem so perfectly fine-tuned that many people have looked at them as proof for the existence of God. While we can certainly be grateful for the seemingly perfect starting point that God has given us and marvel at the beauty of our intricate universe, it isn't exactly an iron-clad argument--of course the conditions are perfect for the existence of life, if they weren't, there wouldn't be anyone here to notice that they were off! The presence of solar eclipses strikes me as a little bit different, though. There is really no reason why we should even be able to see them, nothing about the variables involved are necessary for the existence of life and it is most likely that there are relatively few places in the universe where something like our total solar eclipse is even possible and few time periods in our planet's history when it would be an impressive sight. The Moon is about 400 times smaller than the Sun--now, our Sun is pretty average-sized for a star at this stage in its sequence and our Moon is a little larger than would be expected for a planet our size, nothing Earth-shattering there. The Sun is about 400 times further away from the Earth than the Moon is--again, we are the right distance from the Sun for a planet to be habitable and our moon is a normal distance from us, so this in itself isn't strange. The Moon's orbit around the Earth isn't constant, it wobbles a little and moves a few centimeters away from us every year--a minuscule amount for the distances we are talking about. None of these are terribly interesting on their own, but when viewed together they are pretty impressive. The relationship between the Moon and Sun's sizes and distances from the earth match up almost perfectly...why? There is no real reason for that to be the case, and yet it is! The size of both and their distances from each other are perfectly calibrated to allow us to see total solar eclipses, undoubtedly a rare sight in the universe. What's even more, it hasn't always been that way and won't be that way forever. Since the Moon is slowly moving away from the Earth that means that millions of years ago the Moon would have completely blocked out the Sun, leaving nothing but darkness, and a few million years from now the Moon will be too small in the sky to block the Sun. We happened to come along during the brief window in which solar eclipses occur on our planet. We, Earth's first and only sentient life form, live in a place and during a time in which a solar eclipse is possible. Of course, this isn't an iron-clad proof of the existence of God, either, but for the believer it sure seems providential. It makes you stop and think about the beauty of our universe and the intricate details that are necessary for us not only to exist, but to see such incredible things. Thank God for our magnificent cosmos and for putting us in a time and a place to see His wonders all around us! St. Clare of Assisi, in what has to be one of the most hilarious papal pronouncements of all time, was named the patron saint of television by Pope Pius XII in 1958 even though she lived seven centuries before its invention. The oft-provided rationale is that when Clare was ill in her convent and was unable to attend Mass, she received a vision on her wall of the Mass taking place, I guess making her the first to watch closed-circuit TV. The deeper meaning behind Pope Pius' designation, I have to think, lies in the fact that Clare's entire ethos is a near perfect refutation of the flaws of modern society. Where, in the age of television, we seek instant gratification, Clare sought virtue. Where we seek control over every aspect of our lives and others' lives, Clare sought abandonment to the Divine Will. Where we seek comfort, Clare sought poverty. Where we fill our days with a thousand little worries and concerns, Clare sought perfect simplicity. Where we seek power, Clare sought the silence of the monastery. Where we seek self-fulfillment, Clare sought God and God alone. Enjoy a little clip of St. Clare and St. Francis together from Franco Zefirelli's film Brother Sun, Sister Moon. Today at Our Lady of Mt. Carmel Church we celebrate the Solemnity of Our Lady of Mt. Carmel, our patroness. Remember, like the prophet Elijah on Mt. Carmel, to spend some time in silence to listen for the voice of God. Remember, like St. John the Baptist, to gain strength from your prayer so that you can go out into the world and announce the coming of Christ. Remember, like the great Carmelite saints, to never stop striving to grow in your relationship with God. We pray today for the guidance, protection, and example of Our Lady of Mt. Carmel as we find the quiet and prayerful Mt. Carmel in our own lives. May God bless you on this special day. Perhaps no Christian since the days of the Apostles has had more of in impact on the development and future of the Church and western culture as a whole as St. Benedict of Nursia. As the author of the Rule of St. Benedict and the founder of modern religious life, his family tree would include such monumental figures as St. Francis of Assisi, St. Ignatius Loyola, St. Thérèse of Lisieux, and St. Teresa of Calcutta. His monastic system would eventually give birth to modern schools, hospitals, orphanages, wineries, and universities. Benedictine monks helped develop modern agriculture, metallurgy, and genetics. Their numerous inventions range from Parmesan cheese to the mechanical clock. The monasteries of late antiquity and the early middle ages preserved and advanced upon the literary, scientific, and cultural achievements of the ancient world to the benefit of generations to come. As impressive as these achievements are, however, St. Benedict certainly did not live and teach the life that he did in order to facilitate any of them. St. Benedict's primary mission, like all saints, was to serve as the salt and light of the world. Over 100 years before Benedict's birth in 480 AD the situation Christians found themselves in within the bounds of the Roman Empire was quite different from the one their ancestors had faced. With crucifixion or beheading no longer a real possibility, the new threat to the Christian was complacency. Gone were the days of the heroic martyrs and in their place was a world were Christianity was not only not persecuted, but favored. It was in this setting that early ascetics like St. Anthony of the Desert decided to voluntarily live a life of extreme poverty and prayer, the martyrs of the new society. It was into this tradition that St. Benedict of Nursia stepped. He realized that this extreme and solitary life of a holy hermit was certainly not the best option for a novice looking to grow in holiness and could easily lead a person down the wrong path. His solution was to develop and teach a rule of life that set guidelines for groups of Christians living together in community and voluntarily adopting lives of poverty, chastity, obedience, and prayer. These new monasteries quickly became centers of prayer, education, and vitality for their surrounding communities and immeasurably improved the quality of life and holiness of those in their vicinity. The tradition that Benedict began continues to this day in the Order of St. Benedict, but has also given birth to all modern western religious orders such as the Franciscans, Jesuits, and Dominicans. With this back story in mind it is absurd to posit, as some people have, that Benedict's Rule promotes a full retreat from the world and the establishment of separate and isolated Catholic communities. In fact quite the opposite is true. By bringing men or women together to live in intentional communities of faith, to themselves grow in holiness, Benedict from the beginning saw the evangelization of his culture as his primary mission. It wasn't so much a desire to form a pure and undefiled remnant of the Church that motivated Benedict as it was to form the best possible means of engaging and inspiring the Church around him. Benedictine monasteries were set apart from their communities, but they were also established in the midst of wider communities to teach and preach to those around them. As we celebrate the feast of St. Benedict today we remember that he did not call on followers of Jesus to abandon the world, but to engage it, to gently help it grow (Benedictines have been working on this for 1500 years! ), to be salt and light for the world. Our two great loves--The Catholic Church and America. Living in Rome for five years made me more patriotic. Thanksgiving and Groundhog’s Day of all days became displays of patriotism. The Clericus Cup, an international soccer tournament pitting national groups of priests and seminarians against each other, was one of the biggest events of the year for many of us in Rome and a fun source of camaraderie among all of us studying in the Eternal City. But it wasn’t always easy to be Catholic and American. It sometimes seemed like to believe in the ancient Church whose history mostly took place in Europe meant that a person couldn’t truly be a part of the radical experiment in liberty and democracy that was taking place in the New World. It took us a long time as Americans to find our place in the Church, and a long time as Catholics to find our place in America. In the Vatican we were viewed as radicals and newcomers and at home we were viewed as superstitious and untrustworthy. The story of Dignitatis Humanae—the Declaration on Religious Freedom, one of the last and most controversial documents of Vatican II, which we will talk about tonight, is the story of how we discovered a way to make it all work. A story of how we showed that Catholics have something profound to add to the American system and how we made our one great contribution to the teaching of the Church. Every American has the constitutional right to worship as they choose, it is in the Bill of Rights, it has been clarified and emphasized and resides right at the heart of our idea of freedom, it’s listed even before freedom of speech. Now, all this talk about religious liberty was difficult for Catholics in Europe to accept. They were used to Catholic kings and Catholic states. The only example of democracy they had to work with was from the French Revolution where everyone’s head was chopped off, so they were skeptical. For Catholics in America it seemed difficult to be both Catholic and American. It seemed to many like a contradiction to say that the Catholic faith is true BUT that the government can’t favor the Church if Catholics are in the majority. Over time, little by little, the ideal of religious liberty and democracy was introduced, often by Americans, and accepted by the Church. One of the great proponents of the idea that not only was the American system not contrary to Catholic teaching but that it was HELPFUL to it was a Jesuit priest by the name of John Courtney Murray. While he was writing in the 50s and 60s he became something of a minor celebrity, even being featured on the cover of Time Magazine in 1960s after he published his book on America and Catholic theology called We Hold These Truths. Murray said this—in America it’s not that the government can be described as atheist, but LAY. The state in America is responsible for assuring that there is order and freedom so that the people can pursue their own end. You can’t describe America as having a particular religion because in America it is not a king or queen or even a president who hold authority, but the PEOPLE as a whole. The system in America allows Catholicism to truly flourish because it facilitates conversation and offers the freedom for people to choose to follow God without the use of force, something central to the early teachings of the Church. Separation of Church and State, while a new idea for many Europeans, simply means that the American state allows Churches the freedom to ensure the spiritual well-being of their people and doesn’t assume that duty for itself which can happen in dictatorships and monarchies. The American government is content to let the government govern and the Church sanctify. Through the 50’s and 60’s the teaching of John Courtney Murray began to convince people in the Church that perhaps the American system, the idea that faith can only truly flourish when it is CHOSEN, not forced, is central to our Catholic identity and a God-given right. So, after much arguing, much controversy, and with the help of the American John Courtney Murray the Second Vatican Council, in it’s final year, presented the document Dignitatis Humanae—on Human Dignity, which would enshrine forever in Catholic teaching the God-given right of each person to pursue their faith and follow their conscience without coercion. First, the council professes its belief that God Himself has made known to mankind the way in which men are to serve Him, and thus be saved in Christ and come to blessedness. We believe that this one true religion subsists in the Catholic and Apostolic Church, to which the Lord Jesus committed the duty of spreading it abroad among all men…. The beautiful thing about the document is that it bases the right to religious freedom in the dignity of the human person. We are all created in the image and likeness of God. We are all endowed with a conscience. Because of that God OFFERS himself for us to accept, but never forces us to accept his Truth. It means that we as a Church always offer our faith to be freely accepted, we continually enter into the discussion, showing the truth and the beauty of the Gospel, but we never force someone to accept. We realize that, even for those who are raised in the Catholic faith, each individual must choose to follow Christ. We believe that our faith is true, that the Catholic Church is instituted by Christ and guided by the Holy Spirit, but that our God gives us the ability and the capacity to accept that truth freely. But there is another side to the teaching. It also means that each person should be free to live out their faith. That it is the responsibility of each state to ensure that individuals are able to live and act as their conscience tells them, that they are able, within reasonable bounds, to choose for themselves how to raise their children, serve the poor, and preach their faith. Freedom isn’t just about allowing leaving people alone. It isn’t just about allowing people to engage in trivial and unimportant things. The deepest and most important freedoms are the ones that allow individuals to pursue meaning and purpose. To allow people to pursue the most important things in their lives. As Catholics that means the freedom to live our faith and our calling from God. The freedom to follow our consciences, to serve the poor, to preach the Gospel. Without that freedom the others become trivial. Freedom of religion. Freedom of conscience. The dignity of the human person who is free to accept God’s call and live it. That is our contribution as Americans to the powerful play, to the Church. Be proud of it. Be proud to call yourself an American. Be proud to live your Catholic faith in freedom.